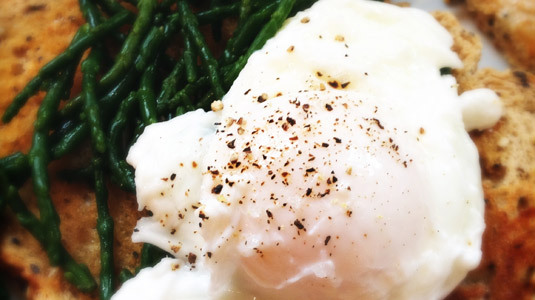 Samphire and poached egg is a really simple but very tasty breakfast. Samphire is to be found growing on the chalky south coast of England. Toast your bread and add spread the butter. Boil some water in a pan. Drop the heat so it is just below the boil. Whizz round with a spoon to create a vortex, break the egg and drop in the centre. In a steamer add the samphire and steam for two minutes. You don’t need to add salt to samphire as it is already very salty! Drain on kitchen paper and place on top of the toast (add a little butter to melt if you desire). When the egg is cooked – the white isn’t translucent any more. Strain and place on top of the toast and samphire. Add a little salt and pepper to the egg and serve. For a decadent extra, serve with a small fillet of steamed fresh trout.